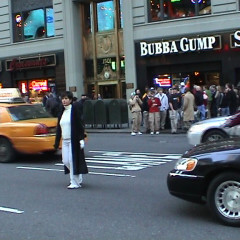 LIUBA is a performance artist and video artist. She works with performance art, urban interactive public art works, video, video installation and mixed media works. 1972 Born in Milan. Lives and works in Milan and New York. Speaks Italian, English and Portuguese. My art work resides in the intersection between art, human geography and technology. It’s related with social, anthropological, geographical, philosophical issues, human behavior, interactivity and chance. I use different skills and media as performance, video, photography, writings, web, research, cooperation. My interest is primarily in open-structure performances made into everyday life and in the interaction among myself, people, space and chance. I am working now on group performances, inviting people to participate actively to the work. 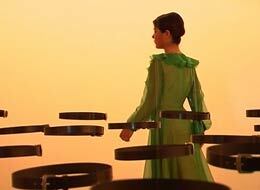 I am interested in the way my performances mirror the identity of a society. My work deals with often social, political and religious subject matter but I like to maintain a somewhat distance and to look for a subtle and ironical approach. I am interested in art going into life. My main interest is life. The Finger and the Moon project #2 has been performed in Saint Peter’s Square, in the heart of Vatican State.A nun in the Vatican is a normal figure, mixed with all nuns of the myriad of congregations walking in Saint Peter. 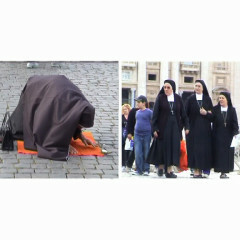 But seeing a nun who prays in other religions caused a short-circuit and many different reactions: surprise, devotion, shock, agreement, interest… and at the end Police stopped the artist, arguing that she was not praying in a ‘normal’ way…What is very new in this project is the simultaneous show of the performance in different cities in the world. Using the new possibility of technologies the new interactive public art performance have been seen live in different part of the world, that in this way were symbolically connected as part of a network. A new website has been designed for the project too. Virus is investigating over the ‘buying bulimia’, that affects the daily-life models and the art world as well. 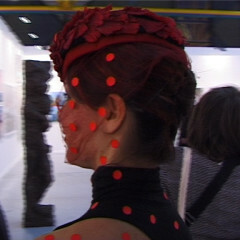 Liuba went to Bologna Artefiera’s opening dressed with red points. Then she took off them from her dress and put over all the art works exhibited at the fair..